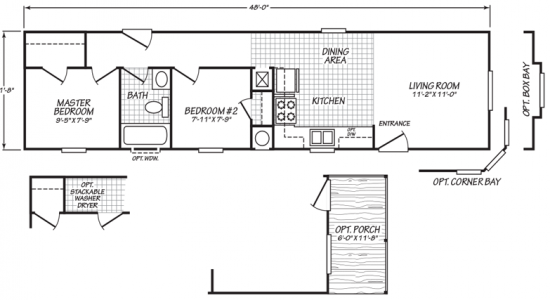 The San Tan model has 2 Beds and 1 Bath. 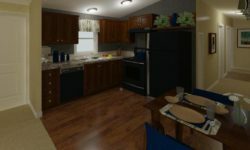 This 559 square foot Single Wide home is available for delivery in California, Arizona, Nevada. Exceptional in its design, the San Tan is full of amazing features. As part of our popular Canyon Lake Series, this stunning single wide already comes standard with an exclusive offering of upgraded features, but the goodness doesn’t stop there. Boost your curb appeal with the optional covered porch and various bay window arrangements. 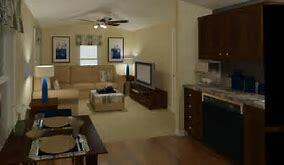 Ask your housing consultant about the other great features that come standard on the San Tan manufactured home.